Archives : BEAR MARKET RALLY - 02/09/2011. BEAR MARKET RALLY – 02/09/2011. The market finally heaved a sigh of relief as the much awaited pull-back finally materialised. The pull-back happened on thin volumes as the week was a short one laced with holidays. The pull-back can be termed as a Bear market rally as the pull-back was very sharp and on thin volumes. Once this pull-back rally is over, the downtrend will resume and a possible retest of the recent low of Sensex 15765 and Nifty 4720 cannot be ruled out. On the higher side, the Bearish Falling gap between Sensex 17358-17664 and Nifty 5229-5323, will act as a strong resistance. The Sensex opened the week at 16080, made a high of 16989, a low of 16068 and closed the week at 16821. The Sensex gained 973 points on a weekly basis. Similarly Nifty opened the week at 4806, made a high of 5113, a low of 4806 and closed the week at 5040. The Nifty too closed with a weekly gain of 293 points. Candlestick analysis presents a study in contrast on the daily and weekly charts. Considering last three weeks candlestick formation, both Sensex and Nifty present a bullish picture as a Bullish Reversal Pattern has been seen in the form of Morning Star, which is despite the missing gap between this week and previous week’s candle. On the daily charts Nifty has formed a Bearish Belt Hold, while the Sensex has formed a black body candle with a slight upper shadow. Nifty has formed a bearish reversal pattern and this pattern can only be negated if Nifty closes above 5113 and Sensex above 16989 on the daily charts. Candlestick analysis seems to suggest bearishness in the very short term and mild bullishness in the short term timeframe. Both the indices had left behind a Measuring Gap i.e. between Sensex 17664-17358 and Nifty 5323-5229. If we consider the start of the downward rally from Sensex 19131 and Nifty 5740, then the target for the rally was at Sensex 15891 and Nifty 4812. That target has been achieved both for the Sensex and Nifty. 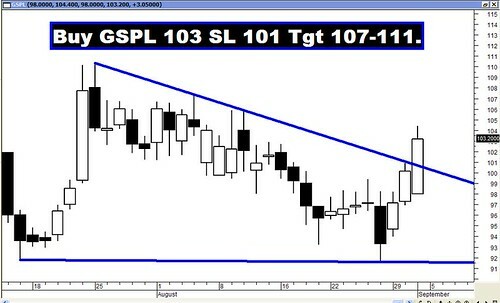 This gap is also a Bearish Falling Gap and hence will act as a strong resistance area in the current pull-back rally. Even though both Sensex and Nifty have managed a close above the 20dma (Sensex -16751 and Nifty – 5033), the closing has occurred in the form of a black body candle and hence it will be prudent to have one more close above the 20dma to say that the short term trend has reversed. The market is well below the medium term average of 50dma (Sensex – 17807 and Nifty – 5351) and long term average of 200dma (Sensex – 18619 and Nifty – 5587). As a result the medium term and the long term trends continue to remain down. There exists strong resistance around Sensex 17311-17448 and Nifty 5188-5230 which is due to convergence of various resistance levels in this zone. 50% of the immediate fall i.e. from Sensex 19131 to 15765 and Nifty 5740 to 4720, coincide with 38.2% of the intermediate fall i.e. from Sensex 19811 to 15765 and Nifty 5944 to 4720. These levels are further aided by the presence of the start of the falling gap. Thus Sensex 17311-17448 and Nifty 5188-5230 will act as first Resistance Zone. Oscillators are presenting a mixed picture. MACD has given a Buy signal but is still in negative territory. RSI is moving higher and is currently placed at 45. ROC has moved higher and is just below the zero line, but still it continues with its Sell signal. The Stochastic oscillator is in buy mode as %K is above %D. Directional Indicators continue in their Sell mode but are converging. ADX is still quite strong at 41 suggesting that the current downtrend is strong. Bollinger band which was in Sell mode for the past few weeks had its stop-loss triggered, when the market managed a close above the 20dma. Money Flow has moved higher at 41 which is inline with the market. The other lead indicator OBV continues with its Sell signal. RSI and MFI were showing some positive divergences on the daily charts. The weekly Stochastic has given a Buy signal but it still remains in oversold territory. Nifty OI PCR has improved and is currently at 1.45. Highest Call writing for the current month series is seen at 5300 strike price and Put writing is seen at 4700 strike. Below 4700, strong open interest build-up has been seen at 4300 Put. One can expect the Nifty to oscillate between 5300 on the higher side and 4700 on the lower side. The market might witness strong selling pressure if 4700 is breached. The next possible support will materialize only at 4300. For the week ahead, Sensex will find Support at 16457-16119-15765 and will find Resistance at 17150-17469-17792. For the week ahead, Nifty will find Support at 4943-4833-4720 and will find Resistance at 5123-5210-5298. Since the market opened with a big gap up on Monday, all the recommendations started above their stoplosses and hence none of the recommendations could get executed.